In this article I would like to focus on the Microsoft Xbox 360 chatpad & Headset, which allows you to perform fast and easy text entry on your Microsoft Xbox 360. 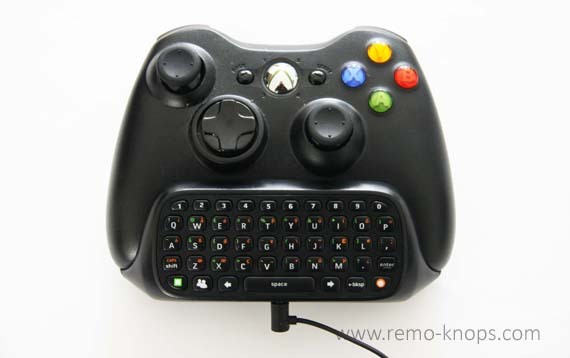 If it is writing a message to a friend on Xbox Live or redeeming a code to download a game, with the Xbox 360 chatpad you can type on a full QWERTY hardware keyboard (in your controller). First lets have a closer look at the Microsoft Xbox 360 chatpad and its design. 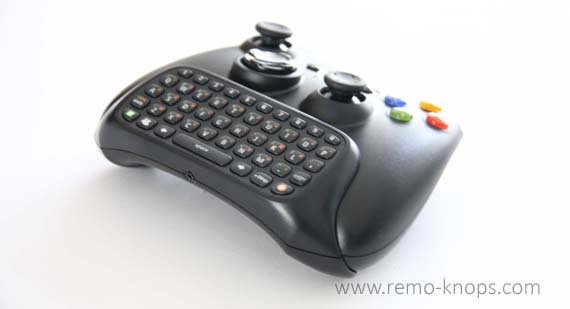 In the picture above you can see that the keyboard of the Xbox 360 chatpad is angled so you can optimally type on it, while holding the controller with both your hands. The full QWERTY hardware keyboard fo the Microsoft Xbox 360 chatpad consists of 5 rows with keys. The numeric keys are on the top row. Remarkable is the short travel of the keys and an excellent click so you know that you pushed a certain key. The next three rows with keys are the alphabetic keys like you are used from a notebook keyboard. You can see additional characters in red or green (in addition to the white alphabetic characters). You can use these symbols by using the green (bottom left) or the red button (bottom right). The bottom row consists of two keys for the symbols and special characters. On both sides of the space-bar in the middle you can see two arrow keys to easily navigate your cursor through the written text. Between the left arrow key and the green key for the symbols you can see a dedicated MSN Live Messenger key, that you can start from your Xbox 360 console. The F-key, J-key and the enter-key have thickening on top of the key which can be used for orientation on the keyboard. Finally I would like to remark the two round ridges for the snap-fit design and the audio connector jack in the top middle of the picture above (between key 5 and 6). On the inside of the Microsoft Xbox 360 chatpad you can clearly see the audio plug in the middle that connects into your Xbox 360 controller. 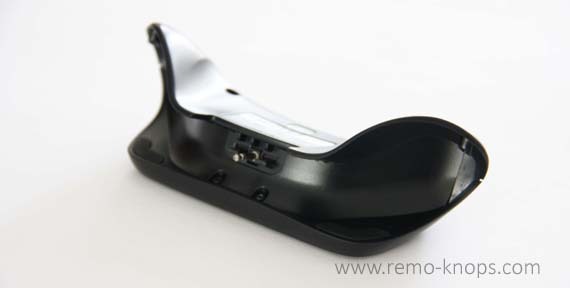 Furthermore you can see the distinguished and curved shape of the Xbox controller, as well as a few plastic ridges( for the snap-fit design) that will be used to snap the Xbox 360 chatpad onto the Xbox 360 controller. 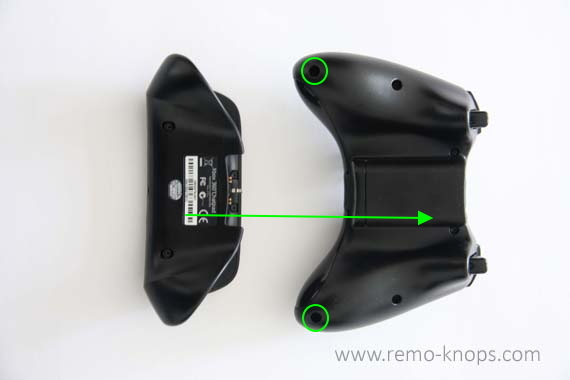 Push the Xbox 360 chatpad into the controller (from left to right in the picture above) with evenly distributed pressure, so the Microsoft Xbox 360 chatpad and the Xbox 360 controller snap together on both sides. The picture above shows the three steps above in a graphical representation. In the picture above you can see the Microsoft Xbox 360 controller and Xbox 360 chatpad snapped together. You can see that the surface seamlessly fits together without any gaps. 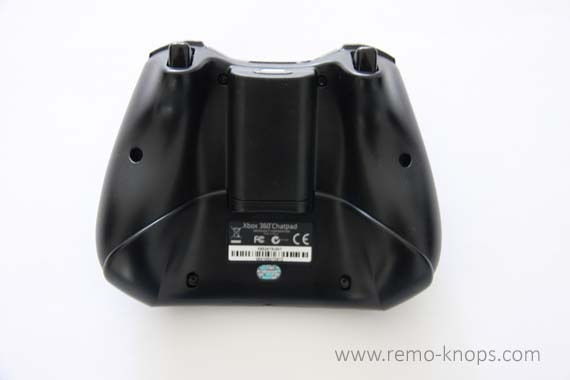 When you have the Microsoft Xbox 360 controller with the connected chatpad in your hands, you won’t feel any brims or slots that impact the pleasant grip on the controller. 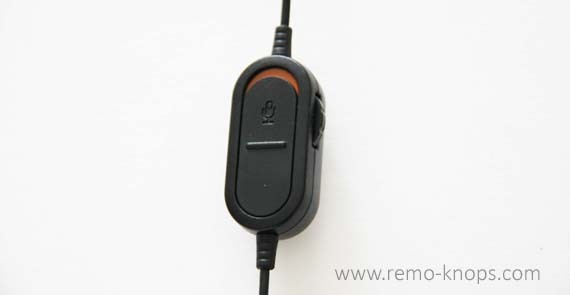 In the cord of the Xbox 360 headset there is a volume control unit attached. You can turn the headset volume up and down with the roll wheel on the right. Or you can mute the microphone completely with the mute button on the front of the volume control unit. You can also clip the volume control unit onto your shirt. Earlier in this article I wrote about the 2.5 mm audio jack at the bottom of the Xbox 360 chatpad. When the Xbox 360 chatpad is connected to your controller you can simply plug the Microsoft Xbox 360 wired headset plug into the audio jack in the middle of the backside. In the picture above you can see the connected Xbox 360 headset. Personally I think this is simply a must-have Microsoft Xbox 360 accessory, because it allows you to write messages to friends very fast (compared to the default way of selecting a letter with the joysticks). The retail package consisted of both the Microsoft Xbox 360 chatpad and Microsoft Xbox 360 wired headset, with a price point of slightly below € 30,-. So in fact you get two accessories for the price of one. Because I have an adapter from a 2.5 mm audio connector plug to 3.5 mm. I can use the Xbox 360 headset for Skype on my notebook as well. A little while ago I wrote an article about How to add / remove a Microsoft Xbox 360 320GB Media Hard Drive to a Microsoft Xbox360 with just 4GB internal memory. If you only have a 4GB Microsoft Xbox 360 you might want to check out that article. Hey!, I found this information for you: "Set-up Xbox 360 Chatpad & Headset". Here is the website link: https://www.remo-knops.com/3941/set-up-xbox-360-chatpad-headset/. Thank you.